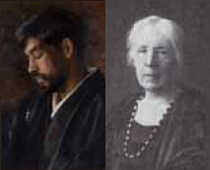 In 1911, Heizo Omori from Okayama prefecture and his wife Annie Shepley from New England,the USA (also known by her Japanese name, Aniko Omori) opened Yurin-en in Yodobashi ward (present day Shinjuku, Tokyo) at their own expense. It was a center offering social welfare services primarily for impoverished youngsters and became a pioneer of the type of settlement houses that sought to improve people’s lives and support their cultural development. The facility later became the first kindergarten in Japan. Aniko worked as the school’s headmistress and, even after her husband’s death, devoted thirty years of her life to the center, even taking care of people suffering in the wake of the great Kanto earthquake of 1923. 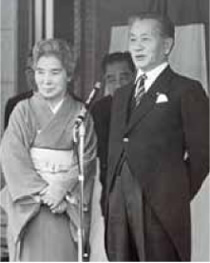 One supporter of the Yurin-en was Takechiyo Matsuda, who would go on to become the Speaker of the House in Japan’s House of Representatives. At the age of thirteen, Takechiyo Matsuda traveled alone to the United States, and on his return to Japan aspired to make contributions to the country’s social welfare services. 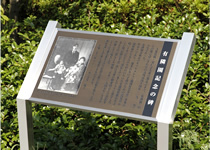 He helped manage Yurin-en and married Heizo Omori’s niece, Sumie Fujiwara. In 1928, Matsuda was elected to the House of Representatives. He contributed to the development of welfare services, becoming Minister of Education and later Speaker of the House. Although Yurin-en was destroyed in the bombing of the Second World War, after retiring from politics Matsuda created the “Bien Hoa Orphan Vocational Training Center ‘Yurin-en’” in Vietnam during the years of conflict there. The center helped orphans learn skills that enabled them to become financially independent. As headmaster, Matsuda, together with his wife Sumie, devoted the rest of his life to the center until passing away at the age of ninety-two. After his death, Takechiyo Matsuda’s daughter Taeko took up the mantle of her father’s work, having returned to Japan from years of study in the United States with the idea to promote projects “for Japan and for society.” Aiming to improve housing in Japan, she founded a housing manufacturing company and created an association to support companies in the residential construction industry. She developed the Yurin-en in Vietnam into an institution that provided many Vietnamese young people with opportunities to gain personal and financial independence until its closing in 2006. 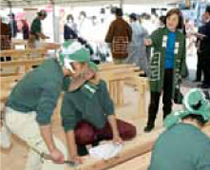 She also obtained a doctorate in engineering from Tokyo University in 1999, and has been engaged in an education project to keep traditional Japanese wood construction methods alive. This passion for the “cultivation of talented individuals for the betterment of society” is the underpinning of her wide-ranging efforts and dedication to creating the programs offered by the Global Life Learning Center. Since its start in 1983, the center has continued to offer encouragement and support to all who wish to learn.